After his escape from Tibet, Ven. 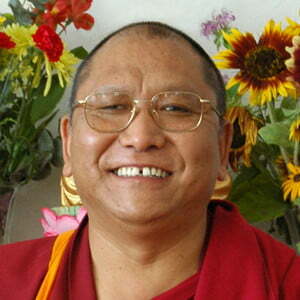 Geshe Kalsang Damdul studied at the Central School for Tibetans in Mussoorie, India. In 1973, he continued his education at the Institute of Buddhist Dialectics in Dharamsala where he studied all the major Buddhist texts. He received his Master of Prajnaparamita (Perfection of Wisdom Sutra) degree and was also awarded the Master of Madhyamika degree. Since 1987, Geshe-la has served as Assistant Director for the Institute of Buddhist Dialectics under the direct administration of His Holiness the Dalai Lama. In 1995, he received his geshe degree from Drepung Loseling Monastery in South India. Spiritual advisor of the Northwest Tibetan Cultural Association and resident teacher at the Shakyamuni Tibetan Buddhist Center in Portland OR, he has also taught at Portland State University as a visiting Tibetan scholar.